"The community that lives and works together"
Location of Deerfield in Lake and Cook County, Illinois. Originally populated by the Potawatomi Native Americans, the area was settled by Horace Lamb and Jacob B. Cadwell in 1835 and named Cadwell's Corner. A shopping center located on the site of Cadwell's farm at Waukegan Road and Lake Cook Road still bears that name. The area grew because of the navigable rivers in the area, notably the Des Plaines River and the Chicago River. By 1840, the town's name was changed to "Leclair". Within a decade, settler John Millen proposed a further name change to "Deerfield" in honor of his hometown, Deerfield, Massachusetts and the large number of deer living in the area. At the time, the alternate name for the village on the ballot was "Erin". "Deerfield" won by a vote of 17-13. The village's first school, Wilmot School, was founded in 1847. Originally a one-room schoolhouse, Wilmot is now an elementary school which serves 548 students. It is located on land donated by Lyman Wilmot, whose wife, Clarissa, was the village's first school teacher. The village was incorporated in 1903 with a population in the low 400s. In a 1917 design by Thomas E. Tallmadge of the American Institute of Architects, Deerfield (and adjacent Highland Park) served as the center for a new proposed capital city of the United States. By that year, all of Deerfield's original farms had been converted either to residential areas or golf courses. On May 26, 1944, a US Navy plane crashed in Deerfield on the current site of the Deerfield Public Library, killing Ensign Milton C. Pickens. Following World War II, a portion of Waukegan Road (Route 43) that runs through Deerfield has been designated a Blue Star Memorial Highway. In 1959, when Deerfield officials learned that a developer building a neighborhood of large new homes planned to make houses available to African Americans, they issued a stop-work order. An intense debate began about racial integration, property values, and the good faith of community officials and builders. For a brief time, Deerfield was spotlighted in the national news as "the Little Rock of the North." Supporters of integration were denounced and ostracized by angry residents. Eventually, the village passed a referendum to build parks on the property, thus putting an end to the housing development. Two model homes already partially completed were sold to village officials. The remaining land lay dormant for years before it was developed into what is now Mitchell Pool and Park and Jaycee Park. At the time, Deerfield's black population was 12 people out of a total population of 11,786. This episode in Deerfield's history is described in But Not Next Door by Harry and David Rosen, both residents of Deerfield. Since the early 1980s, Deerfield has seen a large influx of Jews, Asians, and Greeks, giving the community a more diverse cultural and ethnic makeup. On June 27, 1962, ground was broken by Kitchens of Sara Lee (now Sara Lee Corporation) for construction of the world's largest bakery. The plant, located on the current site of Coromandel Condominiums on Kates Road, began production in 1964 using state-of-the-art materials handling and production equipment. It was billed as the world's first industrial plant with a fully automated production control system. President Ronald Reagan visited the plant in 1985. The plant closed in 1990 as Sara Lee consolidated production in Tarboro, North Carolina. By 1991, headquarters employees had moved to downtown Chicago. In 2007, Sara Lee severed its final tie to its former home town with the closure of the Sara Lee Bakery Outlet Store. In 1982, Deerfield began an experiment with a community farm. Two hundred residents applied for plots on a 3-acre (12,000 m2) community garden. The project had such a strong initial success that the village opened additional community farms on vacant land in the village. As of 1987 Deerfield was mostly made up of single-family houses. As of that year the resale prices of Deerfield houses ranged from $100,000 to $300,000. 43.5% of the town's land consisted of single-family houses, while 1.1% contained multi-family housing. As of that year little of the remaining land was available for further residential development. On December 19, 2005, the village board passed a strict anti-smoking ordinance. The law bans smoking in all public places, including businesses, bars, restaurants, parks, parade routes, public assemblies, and within 25 feet (7.6 m) from any of the above. In November 2007, BusinessWeek.com listed Deerfield third in a list of the 50 best places to raise children. The rankings were based on five factors: school test scores, cost of living, recreational and cultural activities, number of schools and risk of crime. Deerfield ranked behind Groesbeck, Ohio, and Western Springs, Illinois. In 2015, a plan to rezone a parcel of land originally zoned for single-family homes, in order to allow the construction of a 48-unit affordable apartment building complex, was proposed. Some Deerfield residents were opposed to the proposition. Located in front of Kipling Elementary School is the Deerfield Historic Village, founded and maintained by the Deerfield Area Historical Society, this outdoor museum consists of five historic buildings and includes the headquarters for the Deerfield Historical Society. The Historic Village includes the Caspar Ott House, considered to be the oldest building in Lake County, built in 1837. It was restored by Bob Przewlocki. The George Luther House (1847) now includes the Society's offices and Visitor Center. The Bartle Sacker Farmhouse (1854) is a typical 19th century home. While those buildings are all original (although relocated from their original sites), the carriage house and little red school house are replicas. Each year, all fourth graders in district 109 spend a day learning in the school house. According to the 2010 census, Deerfield has a total area of 5.62 square miles (14.56 km2), of which 5.58 square miles (14.45 km2) (or 99.29%) is land and 0.04 square miles (0.10 km2) (or 0.71%) is water. As of the census of 2000, there were 18,420 people, 6,420 households, and 5,161 families residing in the village. The population density was 3,359.4 people per square mile (1,297.8/km²). There were 6,518 housing units at an average density of 1,188.7 per square mile (459.2/km²). The racial makeup of the village was 95.88% White, 0.33% African American, 0.04% Native American, 2.52% Asian, 0.02% Pacific Islander, 0.43% from other races, and 0.77% from two or more races. Hispanic or Latino of any race were 1.69% of the population. There were 6,420 households, out of which 43.9% had children under the age of 18 living with them, 73.0% were married couples living together, 6.0% had a female householder with no husband present, and 19.6% were non-families. 17.8% of all households were made up of individuals and 8.6% had someone living alone who was 65 years of age or older. The average household size was 2.81, and the average family size was 3.21. In the village, the population was spread out with 30.6% under the age of 18, 3.7% from 18 to 24, 26.8% from 25 to 44, 26.0% from 45 to 64, and 13.0% who were 65 years of age or older. The median age was 40 years. For every 100 females, there are 93.3 males. For every 100 females age 18 and over, there were 88.5 males. In 1982 a 324-acre (131 ha) tax-increment-financing district opened along Lake-Cook Road, spurring business development. As of 1987 the office leasing activity in Deerfield increased tremendously, and throughout the 1980s office buildings were developed along Lake-Cook Road, between Interstate 294 and Waukegan Road. Two hotels, an Embassy Suites and a Hyatt, opened during the era to accommodate the increased business traffic. Factors augmenting the establishment of businesses along the corridor included the opening of the district, the abundance of vacant land, and the corridor's proximity to the Chicago Loop and O'Hare International Airport. Deerfield is home to the headquarters of Baxter Healthcare, Beam, Big Apple Bagels, CF Industries, Consumers Digest, Caterpillar, Così, Fortune Brands Home & Security, Mondelēz International, United Stationers, and Walgreens Boots Alliance, As of 2009 Walgreens employed 5,200 people at its headquarters. As of 2003 Baxter employed a total of 1,000 employees in its headquarters and in other offices in Deerfield. Deerfield was at one time the bakery division headquarters of the Sara Lee Corporation. In 1987 Sara Lee had about 1,200 employees in Deerfield. In 1990, the Deerfield Sara Lee plant and bakery headquarters was closed, and the land was sold to developers. During 1987, Baxter Travenol (later Baxter International) had about 1,500 employees and Walgreens, then in an unincorporated area near Deerfield, had about 1,100 employees. In 1985, President Ronald Reagan visited the Sara Lee factory in Deerfield. Deerfield houses the headquarters of some U.S. subsidiaries of Takeda Pharmaceutical Company, including Takeda Pharmaceuticals North America, Inc., Takeda Pharmaceuticals International, Inc., and Takeda Global Research & Development Center, Inc. In 1998, a significant portion of the Deerfield downtown area (comprising a then-outdated shopping center called the Deerfield Commons and the former Deerfield Savings and Loan) was demolished and replaced with a new outdoor shopping district, Deerfield Square, sometimes called "The Square" or "The Commons" by some Deerfield residents. This district is composed of shopping stores, restaurants, and workout facilities, such as Barnes & Noble, Cafe Zupas, Footloose, Potbelly Sandwich Shop, CorePower Yoga, Whole Foods Market, and Pure Barre. In addition to merchandising space, Deerfield Square includes office space and an outdoor plaza which is used during the summer for free outdoor concerts. Along the border with Northbrook, Deerbrook Mall opened in 1971. It includes both an indoor and outdoor shopping area- the last store located inside the mall was TJ Maxx which moved to Northbrook in 2014, finally allowing the interior of the mall to close. Near Deerbrook Mall is Cadwell's Corners, a small outdoor mall that carries the village's original name. Cadwell's Corners was mostly empty of stores by 2011, and the Deerfield Public Library selected the location for a temporary library during renovation of their original building. Since Fresh Thyme moved in in June 2014, Cadwell's Corners has filled in. The village hall is called the Bernard Forrest Deerfield Village Hall. The United States Postal Service operates the Deerfield Post Office. Deerfield is served by Deerfield Public Schools School District 109, which operates four public elementary schools (Kipling, South Park, Walden, and Wilmot) and two public middle schools (Caruso and Shepard). The village is also home to one Roman Catholic school, Holy Cross School ( closing at the completion of the 2017-2018 school year), one Conservative Jewish school, Rochelle Zell Jewish High School, formerly known as Chicagoland Jewish High School, and two Montessori schools. The majority of Deerfield's children go on to attend Deerfield High School; however, a small portion attend Highland Park High School (both of which comprise School District 113). Deerfield High School was one of the top high schools in the state, ranking #5 in 2012. At one time, District 109 contained as many as eight elementary schools. However, Maplewood, Woodland Park, Briarwood, and Cadwell, (the original Deerfield Grammar School located on Deerfield Road was torn down to build the District Offices) were all closed beginning in the 1970s through the 1980s and their students absorbed by the four larger, remaining elementary schools. Deerfield has two Metra stations connecting it to downtown Chicago, both on the Milwaukee District/North Line. Paul Adams, longtime Deerfield High School football coach. Barry Bradford, teacher, author, helped reopen Mississippi Burning and Clyde Kennard cases; National Teacher of The Year, winner of Golden Apple Award for Excellence In Teaching, Presidential Citation for Civilian Service. T. C. Furlong, guitarist, co-founder of the Jump 'N the Saddle Band, and producer of "The Curly Shuffle"
Fred L. Turner, retired chairman and CEO of McDonald's Corp. In 1979, Deerfield created a "No-Kissing Zone" at the local train station in response to complaints about traffic jams at the station caused by couples taking too long to kiss their goodbyes at the drop-off point. The "No-Kissing" signs (patterned after international traffic signs) attracted national attention and were featured in Time magazine and ABC's AM America (precursor to "Good Morning America"). A Deerfield family appearing on the game show Family Feud presented Richard Dawson with replica pins of the signs. In the 1980s, Deerfield and other North Shore communities inspired the teen films of director/screenwriter John Hughes. The fictional Shermer, Illinois, included elements of Deerfield and neighboring Northbrook and Highland Park. A number of media properties have been set and/or filmed in Deerfield, including television drama Once and Again, comedy Married... with Children and portions of reality show American High. In film, the Deerfield train station is shown in the film Risky Business, and Stolen Summer used various parts of the village. The village was identified as the hometown of Kitty Pryde in the X-Men comics. Deerfield also figures in the musical Dear Edwina, written by Marcy Heisler, a Deerfield native, and Zina Goldrich. The fictional protagonist lives at 427 Birchwood Avenue. Although the play is set in Paw Paw, Michigan, much of it (including the address) is inspired by Heisler's hometown, Deerfield. In 2010, the History Channel's documentary The Crumbling of America mentioned Deerfield in a discussion of frequent blackouts that residents experienced over 2000 times from 2000 to 2009. ^ a b c d e Reichelt, Marie Ward (1928). History of Deerfield. Glenview Press. ^ a b ""Small Town" Deerfield Kisses and Tills". Chicago Tribune. 1982-05-09. pp. N–B1C. ^ "Glenview Plane Falls in Garden; Ensign is Killed". Chicago Daily Tribune. 1944-05-27. p. 6. ^ a b Rosen, Harry; David Rosen (1962). But Not Next Door. Astor-Honor Inc. ISBN 978-0-8392-1007-8. ^ a b "Deerfield, IL". Encyclopedia.chicagohistory.org. Retrieved 2016-02-26. ^ "Sara Lee / Our History". Sara Lee Corp. website. 2008. Archived from the original on 2008-07-21. Retrieved 2008-07-29. ^ a b c Little, Anne. "TAKING A CORRIDOR TO SUCCESS DEERFIELD'S ECONOMY BOOMING WITH OFFICE BUILDINGS." Chicago Tribune. July 8, 1987. Deerfield/Northbrook 5. Retrieved on February 2, 2011. "Sara Lee is one of Deerfield's major employers with about 1200 employees[...]" and "Other major employers include Baxter Travenol with about 1,500 employees, and the corporate headquarters of Walgreen Co., which is in an unincorporated area on the western side of Deerfield, with about 1,100." ^ "Deerfield Passes Smoking Ban". ABC7 Chicago. 2005-12-19. Retrieved 2007-07-14. ^ MacMillan, Douglas (2007-11-16). "Great Places to Raise Kids -- for Less". BusinessWeek.com. ^ Berkowitz, Karen (May 15, 2015). "Affordable Zion Woods apartments draw swift opposition - Deerfield Review". Chicago Tribune. Retrieved 30 November 2015. ^ Chen, Tanya (April 3, 2018). "This Town Just Banned Assault Weapons. Anyone Who Refuses To Give Theirs Up Will Be Fined $1,000 A Day". Buzz Feed News. Retrieved 5 April 2018. ^ a b c "Deerfield Historic Village". Deerfield Area Historical Society Website. Deerfield Historical Society. 2002. Retrieved 2008-05-06. ^ Holmes, Deborah; Bob Przewlocki (2007). "Log House Revival". Old House Web. Old House Web. Retrieved 2008-05-06. ^ "Community - Historical Society". Village of Deerfield Website. Village of Deerfield. 2002. Archived from the original on 2008-04-24. Retrieved 2008-05-06. ^ "Contact Us." Baxter International. Retrieved on February 2, 2011. "Corporate address: One Baxter Parkway Deerfield, IL 60015-4625." ^ [dead link] "Beam Inc. Begins Life as a Pure-Play Spirits Industry Leader" Archived 2011-10-14 at the Wayback Machine.Business Wire (via Yahoo! Finance). October 4, 2011. ^ "About BAB Inc". bigapplebagels.com. Archived from the original on March 25, 2014. Retrieved May 6, 2012. ^ "CF Industries Profile: Overview". Cfindustries.com. Archived from the original on 2016-03-04. Retrieved 2016-02-26. ^ "How can we help you?". Consumers Digest. Retrieved 2016-02-26. ^ "CT Caterpillar Headquarters Deerfield". ChicagoTribune.com. ^ "Cosi - getcosi.com FAQ popup". Archived from the original on May 6, 2012. Retrieved May 6, 2012. ^ Fortune Brands Home & Security Now Independent, Begins Trading on NYSE Archived 2011-10-13 at the Wayback Machine, Businesswire, October 4, 2011. ^ "USI Contact Us". Archived from the original on April 23, 2012. Retrieved May 6, 2012. ^ "Contact Us." Walgreens. Retrieved on January 30, 2011. "Write Walgreen Co. 200 Wilmot Road Deerfield, IL 60015." ^ "Strong medicine at Walgreens: 1,000 cuts." Chicago Tribune. January 9, 2009. News 34. Retrieved on February 2, 2011. "About 500 of those cuts will occur at the 5200-person headquarters." ^ Long, Hwa-shu. "Baxter to lay off 2,500 workers Blood therapy business: Deerfield firm will close 26 plasma collection centers." The News Sun (Waukegan, IL). July 3, 2003. Retrieved on February 2, 2011. "Baxter employs 3000 in Lake County, including about 1000 in its headquarters and related offices in Deerfield[...]"
^ a b Jouzaitis, Carol (June 12, 1990). "Sara Lee To Close Plant In Deerfield". Chicago Tribune. Retrieved 5 September 2012. ^ Remarks to Employees at the Kitchens of Sara Lee in Deerfield, Illinois (Speech). The American Presidency Project. October 10, 1985. ^ "Takeda Pharmaceuticals North America, Inc." Takeda Pharmaceutical Company. Retrieved on February 2, 2011. "Address One Takeda Parkway, Deerfield, IL 60015, USA." ^ "Takeda Pharmaceuticals International, Inc." Takeda Pharmaceutical Company. Retrieved on February 2, 2011. "Address One Takeda Parkway, Deerfield, IL 60015, USA." ^ "Takeda Global Research & Development Center, Inc." Takeda Pharmaceutical Company. Retrieved on February 2, 2011. "Address One Takeda Parkway, Deerfield, IL 60015, USA." ^ "Comprehensive Annual Financial Report : December 31, 2017". Deerfield.il.us. page 139 (pdf 158 of 168). Retrieved 2019-03-01. ^ Sadin, Steve (2012-06-02). "Library Picks Temporary Site". Deerfield Patch. Retrieved 2012-06-02. ^ "Deerfield, IL News - Deerfield Review". Deerfield.chicagotribune.com. Retrieved 2016-02-26. ^ "Bernard Forrest Deerfield Village Hall image". 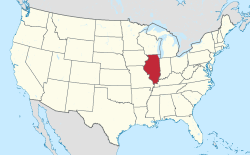 Deerfield.il.us. Archived from the original (JPG) on 2016-02-22. Retrieved 2016-02-26. ^ "Deerfield Post Office". usps.whitepages.com. Archived from the original on October 21, 2010. Retrieved February 3, 2011. ^ "Deerfield Public School Homepage". Dps109.org. Retrieved 2016-02-26. ^ "Top 50 high schools in Chicagoland". Chicago Tribune. October 31, 2012. Archived from the original on December 10, 2012. ^ "Deerfield Campus". TIU Website. Trinity International University. Archived from the original on 2008-05-11. Retrieved 2008-05-16. ^ "Trinity International University". U.S. News & World Report. Retrieved February 1, 2016. ^ Sadin, Steve (March 17, 2019). "Paul Adams, legendary Deerfield football coach, dies at 82". Deerfield Review. Pioneer Press. Retrieved 18 March 2019. ^ "Bob Bell". deerfield collection. cdm.digitalpast.com. Archived from the original on 2018-03-11. Retrieved 2018-12-12. ^ "Tachau Teacher of the Year". oah.org. Archived from the original on January 9, 2011. Retrieved January 7, 2014. ^ "About - Speaking For A Change". Barrybradford.com. Archived from the original on 2012-05-16. Retrieved 2016-02-26. ^ Kamchen, Richard (2007). "Colt Cabana a Matt Classic". Slam! Sports. Slam! Sports. Retrieved 2007-07-14. ^ "Biography for Corinna Everson". IMDB. imdb.com. Retrieved 2007-07-14. ^ "Pete Jones (I)". IMDb.com. Retrieved 2016-02-26. ^ "Lindsay Knapp". databasefootball. databasefootball.com. Archived from the original on 2007-09-30. Retrieved 2007-07-14. ^ Gromer Jeffers, Jr.; Joe Simnacher (September 24, 2012). "Fred Meyer, who built Dallas and Texas GOP into dominant force, dies at age 84". The Dallas Morning News. Retrieved March 18, 2015. ^ Aaron Moorehead. "Aaron Moorehead, WR at". Nfl.com. Retrieved 2016-02-26. ^ "Rauner Visits Deerfield To Tour School's New Science Labs". Patch.com. 2015-04-14. Retrieved 2016-02-26. ^ "Suburbs - Chicago Tribune". Pioneerlocal.com. 2016-02-17. Retrieved 2016-02-26. ^ Krochmal, Pat (2011-10-26). "Deerfield Man Lands in Fishing Hall of Fame". Chicago Sun-Times. Chicago: Sun-Times. Archived from the original on 2013-02-22. Retrieved 2011-10-27. ^ "Art Shay". photosurce. photosource.com. Archived from the original on 2008-06-09. ^ "Remember Dan Walker, the last Democrat to be governor?". Lib.niu.edu. Retrieved 2016-02-26. ^ "Ban the Buss!". Time. 1979-12-17. ^ Seapharris7 (2002-04-15). "Once and Again". Classic TV Hits. Retrieved 2007-07-14. ^ "Filming Locations for "Married with Children" (1987)". IMDB. imdb.com. Retrieved 2007-07-14. ^ "Filming Locations for "American High" (2000)". IMDB. imdb.com. Retrieved 2007-07-14. ^ "Filming Locations for Risky Business (1983)". IMDB. imdb.com. Retrieved 2007-07-14. ^ "Filming Locations for Stolen Summer (2002)". IMDB. imdb.com. Retrieved 2007-07-14. ^ "Pryde, Kitty". Marvel Universe Character Bios. Marvel.com. 2007. Retrieved 2007-07-14. ^ "Henry Schipper, Documentary Producer, Honored with Excellence in Journalism Award". American Society of Civil Engineers. asce.com. Archived from the original on 2012-10-03. Retrieved 2010-06-18. ^ "Sister City Committee". Government - Village Commissions. The Village of Deerfield, Illinois. 2002. Archived from the original on 2012-03-24. Marie Ward Reichelt, History of Deerfield, Glenview Press, 1928. Harry Rosen and David Rosen, But Not Next Door, Ivan Obolensky, 1962.